Couples have heeded the heavenly call of Hawaii’s isles for generations, due to its dramatic natural beauty, cultural authenticity and warm Polynesian hospitality. An idyllic location for a destination wedding or honeymoon, Hawaii abounds with swaying palms, bountiful floral leis, and the lull of ukuleles – the prefect ingredients for a South Pacific romance. Known as the “Islands of the Gods”, thanks to a local legend in which the Sky Father (Wakea) and Earth Mother (Papa) created the six unique islands. Hawaii is located approximately nine hours by aeroplane from Australia’s east coast. The four most popular islands for visitors are Oahu (which is home to the country’s capital – Honolulu), Kauai, Maui and the Big Island. From the cultural attractions and buzz of Waikiki on Oahu to the laid-back charm, soaring cliffs and canyons of Kauai – the “Garden Isle” – you’ll find an island perfect for your tropical escape. Maui is a magnet for couples, offering an enticing mix of activities – from golf courses to art galleries, and natural charms such as the legendary, Kaanapali Beach. For something different, visit the Big Island, which is rich in natural wonders including an active volcano, lush rainforest and striking black- and green-sand beaches. Whichever island you choose, you’re sure to want to linger a while as there’s so much to explore. Oh and don’t forget to indulge in a local Kahuna massage as part of your pre-wedding pampering ritual. The Hawaii Department of Health issues marriage licences, regardless of your visa type. Your passports will generally be sufficient identification, but be sure to arrange your licence in advance of your trip. If you’ve been previously married, you’ll need to present the original divorce decree or death certificate (if applicable) to the marriage agent if the divorce or death was final within 30 days of applying for your marriage licence. Once a licence is issued there is no waiting period required before the marriage can take place. Each island in Hawaii has its own unique climate due to its differing geological configurations; from cool alpine regions to lush rainforests and sunny beaches. The two main seasons are summer (which runs from May to October) and winter (which runs from November to April). Hawaii’s average year-round daytime temperature is usually in the mid- to high-20s (Celsius). The wettest months are from November to March. The United States Dollar (USD) is the official currency of Hawaii, as Hawaii is considered a ‘state’ of America. ATMs are readily available throughout Hawaii. 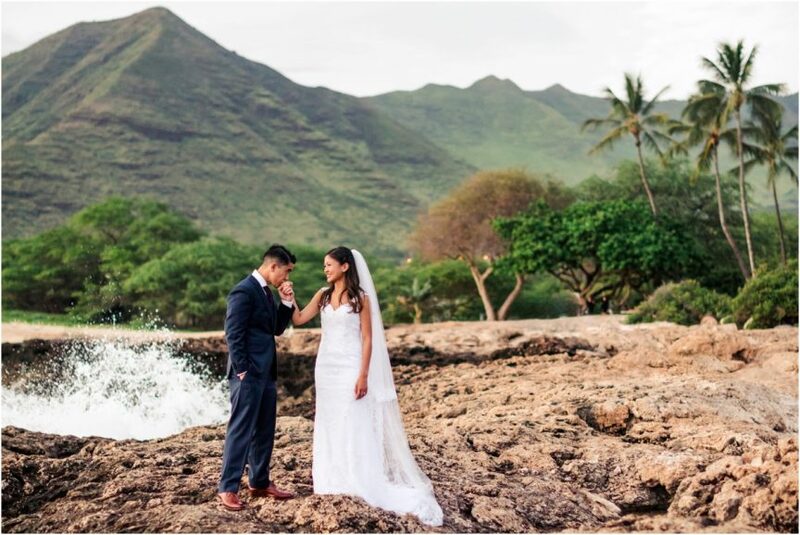 To find your dream Hawaii wedding venue, visit our exclusive directory of stunning resorts and hotels that specialise in destination weddings.